Our best hybrid mattress reviews, 2019, presents our opinion of the best hybrid mattresses available today. Our purpose here is to provide you with a selection of the top 6 hybrid mattresses to enable you to make the ideal choice for your needs. First, what is a hybrid mattress? Many have heard the term but are unsure what it really means. The term simply refers to a mattress that combines the benefits of two or more different types of the mattress or different constructions. The original, and more commonly used example, is a mattress with a top layer of memory foam or latex and a supporting innerspring layer beneath it. Their function is to provide the benefits of each different layer and combine the comfort and support offered by different technologies. Most hybrids involve two systems, but others can use several – three or more. While presented in order of our own ratings, our #1 choice need not necessarily be yours. While some might prefer our #1 or #2 choices, you may feel that the #6 choice might be more appropriate for you. So read them carefully and make your choice. Note: Each mattress is constructed with foam layers over a base of pocketed or interlocked springs and sometimes a dense foam layer. All six mattresses are available in the following sizes: Sizes: Twin, Twin XL, Full, Queen, King, California King. 1.5” of Gel infused memory foam topped with a super soft quilted Thermic phase change fabric. 1.5” of TitanChil Endurance Foam® – a cooing polyurethane foam. 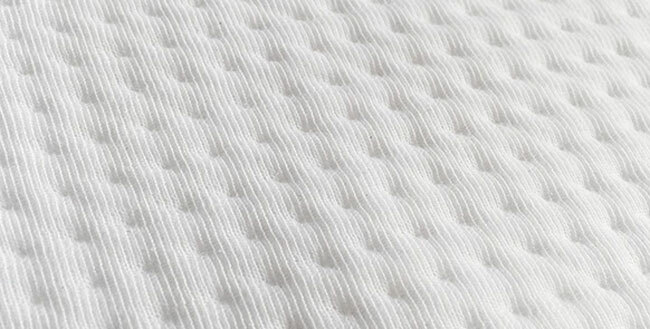 1” of 3 lb Smartflow poly support foam that helps air flow through the mattress. 8” of pocketed steel coils that provide the base support. Medium: This option has a firmness rating of 5. This consists of 3.5 lb copper infused foam. The slow recovery memory foam takes more time than normal for the foam to revert to its original shape after use. The Smartflow poly support has an open structure that increases the flow of air through the mattress. It helps to reduce heat retention and keeps you cooler at night than without it. This is a good type of foam to lie directly over the innerspring layer. The springs are individually pocketed, not only to help isolate the movement of each partner but also to help provide support to the major pressure points: shoulders and hips, while also supporting the lower back (lumbar) region. This is one reason why we rate the Alexander Signature Hybrid Mattress as the best we have tested. The sleeping surface is designed to suit those who sleep in any position. Each layer is designed not only for comfort but also to help remove the heat you generate during the night. CertiPUR-US certified foam – this signifies that the foam contains no phthalates, heavy metals, ozone-depleting CFCs or toxic fire-retardant chemicals. 100 night sleep trial – return within 100 days for a full refund if you do not like the mattress. We could find no negatives for this mattress, which is the main reason for it being rated at #1. Editor’s Notes: The construction of this mattress has been carefully designed to provide support and comfort for most people. The three comfort levels mean that you can choose the best option for your sleeping position and body weight. Each layer has been designed for maximum comfort and its cooling ability. 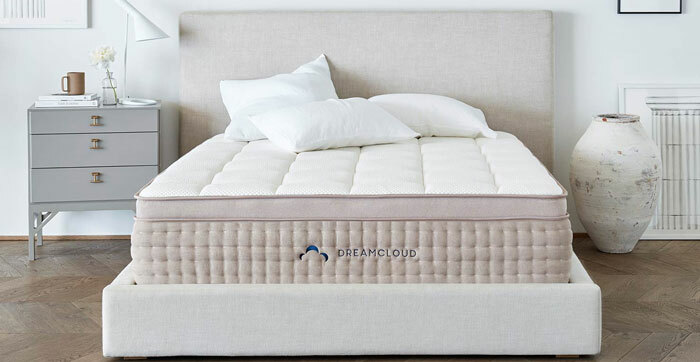 The DreamCloud Luxury hybrid mattress is 15 inches thick with 8 layers that combine to produce a comfortable mattress that keeps you cool during the night and cradles your body regardless of your sleeping position. 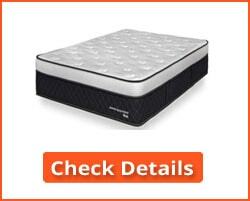 It combines 5 types of memory foam with natural latex and encased pocketed micro-coils. The top is a tufted cashmere Euro top, offering a comfortably soft top layer with maximum airflow for superb cooling. The next layer is a gel memory foam. The gel absorbs heat and spreads it throughout the layer to prevent ‘hot pockets’ while perfectly cradling your body shape. The third layer comprises a soft quilted memory foam, which provides an extremely comfortable sleeping surface when the top three layers are combined. The fourth layer is natural latex that provides the bounce that is needed in a premium mattress that not only helps support you but also has a level of resilience. 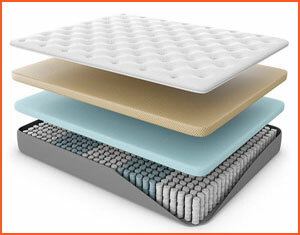 The next layer is the ‘Dream Plush’ high density memory foam that provides support to the layers above it – and to you. As your body moves about in the bed, this layer ensures that the mattress moves its support along with it. Your body will be properly supported throughout the night. The sixth layer is a ‘super-dense’ memory foam. This makes sure that your body is properly supported throughout the night, no matter what position you sleep in. Then we come to the seventh layer of foam encased spring micro coils. This works with the memory foams above to provide a high level of support and comfort and also isolates the movement of you and your partner throughout the night. The bottom, eighth, layer is a high density memory foam that absorbs your weight and helps reduce any motion transfer that gets down through the upper layers of foam and coils. Excellent comfort and support for any sleeping position. CertiPUR-US certified to be free of phthalates, heavy metals, CFCs, ozone depleters or any other toxic substance. Forever Warranty: The warranty is for faults in the materials or faulty workmanship. The mattress will be replaced within the first 10 years, and after that period the company will repair or replace it free of transport charges. 365 Night Sleep Trial: You can use the mattress for 365 days during which you can return it for a 100% refund if you don’t like. Transport will be at the company’s expense. No cost to you at all. White glove service, including set-up of the bed or mattress, is offered but at a price of $149 for the first item. Any other items in the order are charged $45. The White Glove Service cost may or not be regarded as a negative, though many companies offer this service free of charge. Otherwise, no negatives that we could find. Editor’s Notes: The overall result is a very comfortable mattress that absorbs the pressure of your body, and isolates your movement in bed from your partner – and vice versa. There is little to find wrong with this, other than that if you do not like the idea of memory foams, then it may not be for you. That said, it is worth trying, at least for the sleep test period, and get your money back if you don’t like it. Very few people do this because they generally find it to be a superbly comfortable and supportive mattress. Helix offers Plush (Sunset and Moonlight), Medium (Midnight and Dusk) and Firm (Twilight and Dawn) feel mattresses for each of two types of sleepers: side sleepers, who are in the majority, and front and back sleepers – making six options in all. The company also offers a mattress suitable for Plus size people in weight and height (Helix Nightfall) and the Helix Dual Balanced and Dual Extra, all three of which are double sided. Each has a plush feel on one side and a firm feel on the other. The Dual Balanced mattress is for side sleepers and the Dual Extra for all positions of a sleeper. This adds up to a very comprehensive nine mattress types, suitable for all sleeping positions in plush, medium and hard options. 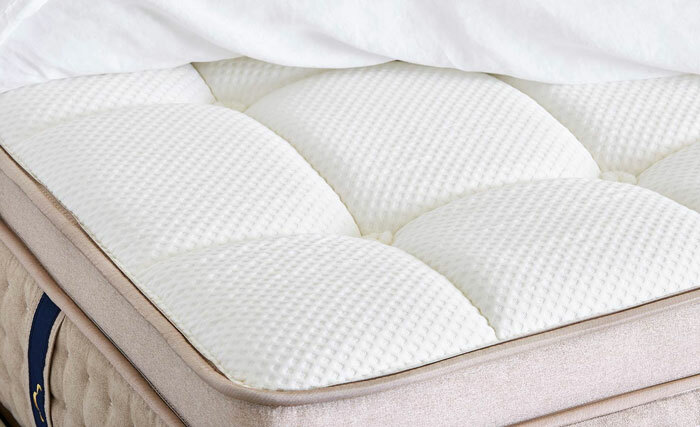 Each is of a hybrid foam-innerspring construction with an optional Luxe version with lumbar support to help prevent or ease the lower back pain, a quilted top, and a cooling cover. This does not apply to the three double-sided mattresses. Great selection of mattresses available to suit your sleeping position, weight and firmness preference. Combinations of memory foam, polyurethane foam and pocketed springs. Good motion separation due to memory foam and individually pocketed springs that are not attached to each other. 10-Year limited warranty against manufacturing and material defects increased to 15 years for the Luxe versions. 100 night sleep trial: return within 100 nights (but after 30 nights) for no-quibble refund. If you feel the sleeping surface doesn’t suit you, you can request an additional comfort layer to increase softness or firmness free of charge. Sleep Quiz establishes your needs and recommends the best mattress for your needs. None that we could find. If you have issues the company has a good support service set up with an excellent sleep trial and warranty. Editor’s Notes: Helix offers the widest range of mattresses available from all the companies included in our best hybrid mattress reviews 2019. It has not been easy to choose the top three best hybrid mattresses due to the high quality of those available. Perhaps Helix offers too much of a choice, making it difficult to choose the best hybrid mattress for your needs. However, if you choose wrongly, then you get to return the mattress within 100 days or get a free comfort layer (softer or harder) to meet your needs. 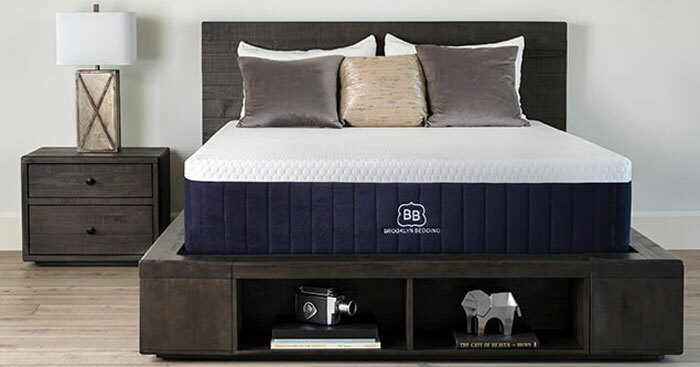 The Bear Hybrid Mattress deserves its place in our top 6 best hybrid mattress reviews 2019 because of its selection of foams and coils. It provides good motion separation, so you can sleep without disturbing your partner – or being disturbed by him or her. It has two layers of foam over a layer of pocketed coils. 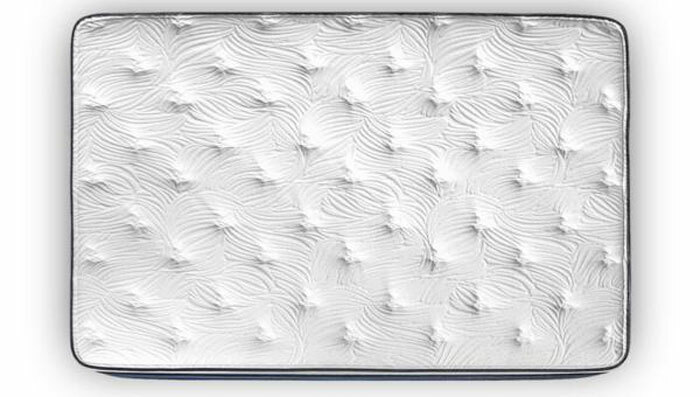 One layer is a gel-infused memory foam that helps with both motion isolation and cooling you when you are sleeping. The support layers comprise 2.5-inch Microcoils and 5 inches of high density polyfoam. The top layers comprise 3 inches of polyfoam and 2 inches of gel memory foam. The top is of a 2-inch quilted Celliant fabric. The result is a 14.5 inch thick mattress. The Quantum edge-support system used helps improve edge support with this mattress. Good support and comfort layers with an overall firmness rating of 6 on a 1 – 10 scale (1 softest). Edge coil system provides reasonable edge support. Suitable for all sleeping positions. Low level of motion transfer between couples. 20-year limited warranty against defective workmanship or materials. 100-night sleep trial – return between 30 and 100 nights for full refund. Lacks the level of bounce needed by some couples. Editor’s Notes: While not strictly a hybrid mattress due to the innerspring component being only the smaller part of the support, the Bear mattress is still regarded as such. It is an excellent mattress with the good isolation of the movement of one partner from the other. The edge coil system provides reasonable edge support. Choose this if edge support is important. Layer 1: A 1.5-inch layer of patented Copper Gel EnergexTM viscoelastic foam. This is not the same as traditional memory foam. It has more bounce for couples and dissipates heat more quickly than memory foam. The surface is infused with TitanCoolTM phase change cooling beads that keep you cool while sleeping. Layer 2: A 2-inch layer of TitanFlex foam. This possesses what are described as ‘hyper-elastic properties’ which acts just like memory foam is changing shape to mold to your body when you move in bed. This results in a superb level of comfort when you are in bed. Layer 3: A 1-inch layer of what is described as ‘Swirl’ visco-elastic memory foam. This enhances the contouring of the mattress to your body. 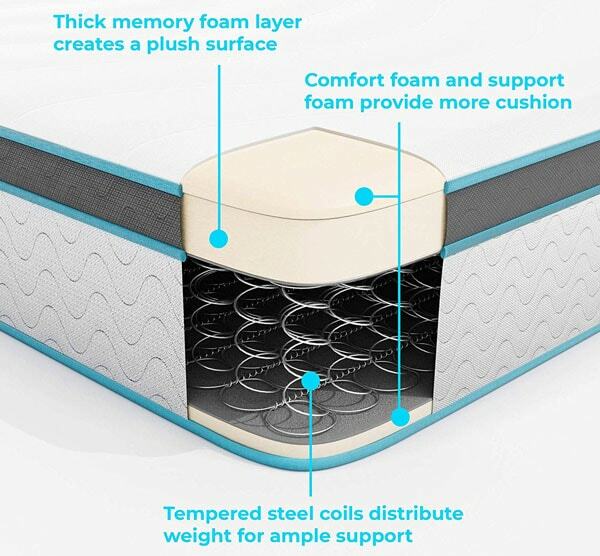 Layer 4: 8 inches of encased coils, up to 1,189 of them, that are referred to as Quantum EdgeTM coils that provide support and a quick reaction to your movement on the mattress that together result in excellent motion separation. Layer 5: A 1-inch base layer of high density foam to help support the coil layer. The Brooklyn Aurora luxury hybrid mattress is available in a choice of three comfort levels. On a scale of 1 (softest) to 10 (firmest) these are Soft (2 – 4), medium (4 – 6) and Firm (6 – 8). The Soft option is good for side sleepers and those that prefer their pressure points to sink into their mattress. The Medium option is best for those that sleep on their side, back and stomach that prefer some contouring but more support. The Firm option is best for stomach and back sleepers who prefer a firmer base to sleep on and prefer not to sink into the mattress too much. Cooling foams that prevent you from getting too hot while sleeping. A choice of three firmness levels for different types of sleeper. Excellent support for pressure points without exerting too much pressure on them. 10 Year warranty against manufacturing and material defects. 120 night sleep trial during which the mattress can be returned free of charge if you don’t like it. The lack of side support is an issue with some users who feel they can roll off. Some users find that using sheets on the mattress eliminates or significantly diminishes its cooling effect. Editor’s Notes: The Brooklyn Aurora hybrid mattress is well constructed with five layers that complement each other. The result is a mattress that helps prevent you overheating at night, and that helps support those parts of your body that need support: shoulders, hips, buttocks, lower back (lumbar region) and knees. The smooth finish of the mattress cover helps to dissipate heat quickly and provides a luxury feel to this mattress. The company also appears to respond rapidly to any issues raised by customers. 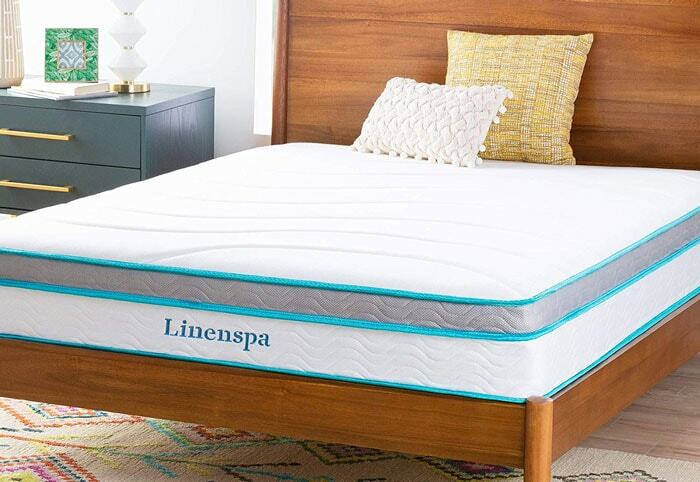 The Linenspa 10-Inch hybrid mattress is a simple construction of quilted memory foam over a comfort foam layer and then a 6-inch innerspring layer of interlocked steel coils. This all sits on a layer of high density support foam. The 10-Inch mattress has a medium feel to it, at a level of 7 on a 1 – 10 scale with 10 the firmest. You can also choose the 8-inch (firmness rating 8) and the 12-inch which also comes with edge support, gel memory foam and individually pocketed coils (plush rating of 5-6). Three levels of firmness according to the thickness of the mattress – we reviewed the 10-inch. Memory foam conforms to the shape of your body and is good for all sleeping positions. The mattress helps provide support to your pressure points and helps prevent lower back pain. Foams used are CertiPUR-US certified. 10-year warranty against faulty workmanship and materials. Return period is just 30 days, so no sleep trial as many other manufacturers offer. Memory foam layer seems a bit thin. Otherwise, the mattress seems good, particularly for side and back sleepers. Editor’s Notes: The Linenspa 10-inch hybrid mattress is rated at #6 because the spring unit does not comprise individually pocketed springs but a regular innerspring unit with the springs interconnected. However, that aside, it is still an excellent hybrid mattress offering alternative levels of firmness: plusher and firmer than the 10-inch version we reviewed. The generally accepted definition of the hybrid mattress is one with an innerspring support base and foam comfort layer(s). The spring layer can take the form of regular coils attached together or as individually pocketed springs that provide better separation of movement between partners sharing the mattress. The comfort layer is generally low-density memory or latex foam. You may read that some firms refer to a hybrid mattress as also being one with foam layers of different density. For example, a high density poly foam support layer with memory foam on top. This is also a legitimate definition for ‘hybrid’. For our purposes, we are referring to a combination of comfort and supporting foam and innersprings. These springs can be interconnected or held within their own individual fabric pockets to separate them from each other. The former can often provide a firmer base, while the latter are best to separate the movement of partners from each other. So how do you choose the best hybrid mattress to meet your needs? Here are some tips on how to buy the most suitable hybrid mattress for you. When you fall asleep your body begins to cool down. This is natural and is when your body and brain repair themselves from all the work they have to do during your waking hours. That’s why you fall asleep every night – or on whatever work-sleep cycle you use. Unless you can prevent your bedding from heating you up, you may have a disturbed sleep – waking up during the night feeling hot and sweaty. If you often wake up during the night feeling too hot, then look for a hybrid mattress with a top layer that helps conduct your body heat away while you sleep. Latex is a good choice if the latex you choose has aeration holes designed to achieve this. Memory foams tend to conform to your body shape and heat you up during the night. However, gel memory foams contain a gel that absorbs heat and disperses it throughout the mattress – not just where you are sleeping. Many use gel beads that change phase when they absorb heat, while others have the gel infused into the foam. Beads can absorb only so much heat, while the infused gel spreads the head rapidly throughout the body of the foam – thus keeping you cool more efficiently. A problem with many couples is that when one moves on the mattress their movement is transferred through the mattress to disturb their partner. There are two ways to avoid this with a hybrid mattress. a) Purchase a hybrid mattress with the support and bounce of a good spring base with a memory foam top layer. Memory foam tends to absorb the pressure of each partner and separate their movement from each other. b) Purchase a hybrid mattress with individually pocketed or encased coils. Since the springs are not connected to each other, the movement of one partner should not transfer to the other. The ultimate solution is to use a hybrid mattress with a pocketed spring base and memory foam comfort layer. Multiple layers are fine, but for an undisturbed sleep a couple should purchase a mattress with those two features: memory foam and pocketed/encased coils. Hybrid mattresses, particularly the best hybrid mattresses, can offer immense benefits to those who need a good, strong support layer but also a comfortable soft sleeping surface. Because of this, some firms are offering inexpensive mattresses that seem to be hybrids but really aren’t. You need to check out whatever hybrid mattress you decide to purchase. Shop around and find the hybrid that meets all your needs – or as many as possible. Comfort, support, motion separation, keeping you cool – these are all properties that are possessed by those products that are included in our hybrid mattress reviews, 2019. Seeking out the best hybrid mattress for you, and making the decision to purchase it, will be easy if you follow our Buyer’s Guide and consider our top 6. If you don’t like your mattress, each offers a good warranty and a sleep trial. The sleep trial enables you to use the mattress for a period of time: from 100 days to 120 days depending on the product. During that period you can return your mattress free of charge. You will usually have to give it 30 days before you decide to return it at no cost to yourself. There is not a lot to be said about hybrid mattresses. If you follow this Buyer’s Guide, you should be able to purchase the best hybrid mattress for your specific needs. If you don’t like it then return it within the Sleep Trial period and try another one! You cannot lose! 1. Must I have a box spring foundation for a hybrid mattress? No – most hybrid mattresses are good with any base or foundation. You can use a solid wood, slatted wood or a box spring if you wish, but there is no specific type of foundation needed for a hybrid mattress. 2. Why is a hybrid mattress so called? What does hybrid mean? The original meaning of the word ‘hybrid’ is the result of crossing two different plant or animal species. Examples are mules (female horse and a male donkey), tigons (male tiger and a female lion) and ligers (male lion and a female tiger). It has become a common term for the product of two different things such as vehicles powered by both gas and battery power. A hybrid mattress is one that combines the comfort of foam with the support and bounce of innersprings. 3. How long should a hybrid mattress last? It should last a minimum of 6 years, though many can last a lot more. A lot depends on the quality of the foams and springs. However, you should find that warranties last longer than that – 10 years or more. Keep in mind that warranties cover you only for faults in workmanship and materials. 4. Can I use a mattress pad or topper with a hybrid mattress? Sure you can – there is no reason why not. In fact, we recommend it, particularly during a sleep trial period. A mattress pad or topper, even a good mattress protector, will protect the mattress against spillages or accidents. If this happens during your sleep trial then it will nullify the trial agreement – and also your warranty. It will also prolong the life of your mattress. 5. 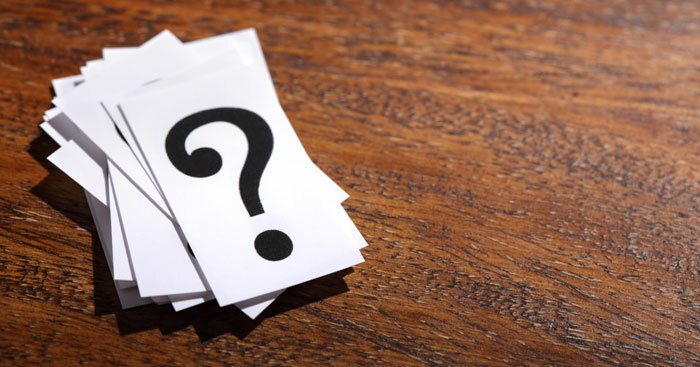 Are hybrid mattresses quieter or noisier than other types of mattress? Hybrids are quieter than innersprings and tend to isolate more motion transfer — both of which can reduce night-time sleep disruptions. 6. Are hybrid mattresses cooler or warmer to sleep on that regular foam or innerspring mattresses? Innerspring mattresses tend to be fairly cool due to the circulation of air between the springs. For that same reason, hybrid mattresses are generally cooler than foam mattresses, particularly memory foams. That’s because of the air circulation within the base innerspring layer. However, the relatively thick comfort layers can generate heat which is why many include cooling gel beads or infusions to help keep them cool. They are certainly cooler than all-foam mattresses. We trust that our best hybrid mattress reviews, are of help if you are looking for information on the best hybrid mattress to suit your needs. If you require further information then contact us using the Contact form on our website.